iCloud is great, but if you’re like most people, you don’t like not being able to delete photos from your Photo Stream. Whether you don’t want silly screenshots showing up on all your devices or are concerned about privacy (NSFW) issues, there are now methods for addressing this nuisance. Here are 3 ways you can remove photos from your Photo Stream; two are done manually and one is done automatically. As of right now if you setup an iCloud Photo Stream you can’t delete the photos from your Photo Stream library, they will sit there until they fall off the end. iCloud stores 1,000 photos in your Photo Stream for 30 days, so once you pass any one of these 2 things, photos will automatically get removed from the Photo Stream. 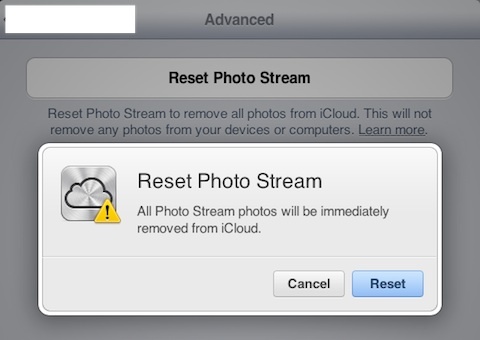 Click Reset Photo Stream and Click on Reset to confirm. Open the Photo Stream folder on your iPhone, iPad, or iPod touch from the Photos app. Here is a video demo of the new individual photo deletion feature coming in iOS 5.1 for Photo Stream users, from Mike Flaminio at Insanely Great Mac.